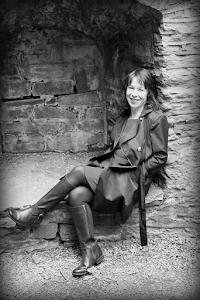 Welcome to The Writing Life blog, an honest, ‘warts and all’ account of my day-to-day life as a writer. I aim to post every 2-3 weeks. For the past 18 months, I’ve blogged about drafting my third novel – the ups and downs, the crap first draft, the sacking of characters, and the major rewriting and restructuring. The hard work has paid off and I feel quite pleased with it at last! I’m now tackling novel number four, and I hope you’ll follow my progress on this journey, too! The blog is a little overdue again, partly because I've been working hard like a good novelist, and partly because, if I'm honest, I've been a bit stressed and nervous this last couple of weeks. As regular readers will know, I'm struggling massively with my third novel. Far more, I think, than I did with books one and two. I wrote a pretty disastrous first draft. Well, I suppose there were some things I could keep. 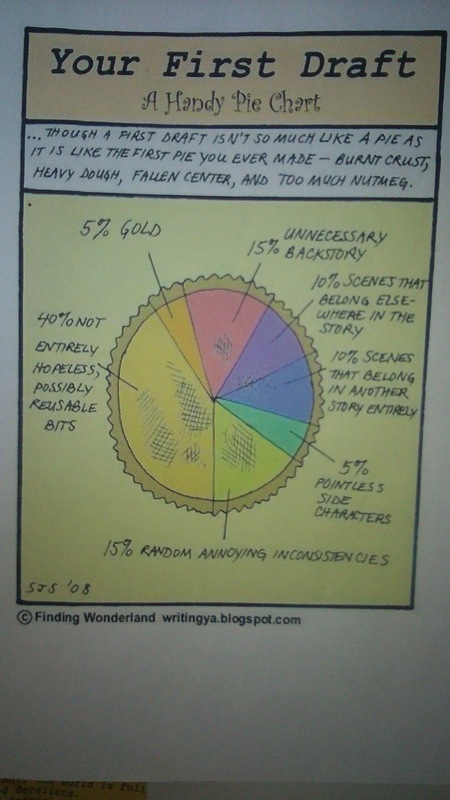 In fact, it wasn't too far away from this brilliant pie chart, which I printed off some time ago from writingyablogspot.com and pinned to my noticeboard. In my case, rather than forty per cent 'not entirely hopeless, possibly reusable bits', I probably had about twenty-five per cent. 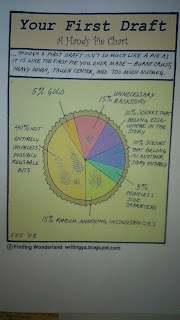 Where the pie chart suggests fifteen per cent 'unnecessary back story', I reckon mine was about twenty per cent. And I'd say twenty per cent of that draft contained scenes (and characters!) that belonged 'in another story entirely'. The initial structure was chronological but jumping forward years at a time with pointless 'filler' scenes in between (what was I thinking??) and although I knew it didn't work, I couldn't see what to do to make it work. I'm still wrestling with the structure to a certain extent, but it's definitely working better now. Anyway, to come back to why I was feeling stressed. I've never made any secret of the fact that I'm finding this novel challenging, I've been extremely open and honest, not only with you lot, but also with my agent and editor. Other writers have questioned the wisdom of this, (and don't think I haven't questioned it myself!) But at the end of the day, if you'll forgive the cliche, I see no point in pretending everything is going swimmingly when it just plain isn't. So, during my last conversation with my wonderful agent, Kate, I told her that my confidence was swinging wildly from, 'yes, I've got it now,' to 'why the hell would anyone want to read this?' We had a long chat and then Kate suggested it might be helpful for me to polish up and submit my first fifty pages to her and my editor, together with a chapter breakdown outlining the structure of the rest of the novel. It took ages to 'polish up' the first fifty pages, because so much had changed. (these were the new fifty pages, mind, not the original ones) Every single decision you make impacts on the rest of the novel. I had to rewrite several chapters simply because I'd changed the layout of the house! Anyway, eventually, I managed to get those fifty pages in the best shape I was able to at this stage - they'll change again, of course - and I sent them off. Then came the tense waiting. They would either say, yes, you're on the right track, carry on, or no, this really isn't working. They got back to me within a week, which, knowing how busy they both are, I really appreciated. Basically, the news is good. There are issues that need addressing, but overall they think it's working much better, they think I can do it; they say carry on! The relief! I hadn't realised quite how tense I was until I got this feedback. I read the email twice and then felt my whole body slump, as though someone had pulled the plug out. I then had to curl up on the sofa in my study and have a little nap, after which I felt much better and was itching to get back to it. I've said I'll deliver this new draft by the end of August, and there's quite a bit to do so I need to really focus now. I still have several new chapters to draft, and lots of editing and rewriting before I submit. And of course there will be lots more revisions afterwards. So after well over a year of false starts, wrong turnings, rubbish drafts and re-drafts, I now feel as though the end is in sight. I'm feeling good at the moment. I know there's loads more work to do, but I'm feeling much more confident about doing it now. Watch this space! Your persistence with gives us all hope - those weeks and weeks of ploughing on, trying to shape something until it at least makes sense - looks like it's paid off. Hurrah!